Ask RP Photonics for advice on lasers for optical sampling. RP Photonics can identify the most suitable laser for your application. Optical sampling (also called optoelectronic sampling) refers to a class of techniques where optical signals (usually in the form of ultrashort pulses) are used to probe electrical signals. Sometimes, however, optical signals themselves are sampled. The duration of a short light pulse limits the time in which the light interacts with the device under test (DUT), which may be a fast electronic circuit, and the effect of the interaction can consequently be monitored without the need for a very fast photodetector. An ultrashort optical pulse hitting a photoconductive switch can close an electrical connection for a very short time (sometimes below 1 ps). This can be used as a very fast gate (e.g. in a very fast analog-to-digital converter), or for generating an extremely short current or voltage pulse (which may be used as a test signal). Typical techniques for sampling of optical signals are based on some cross-correlation signal obtained via a nonlinear interaction, such as the Kerr effect in a nonlinear crystal or four-wave mixing in an optical fiber. Electro-optic sampling exploits the linear electro-optic effect (also called Pockels effect) to obtain an interaction of light and DUT. Photoconductive sampling is based on closing an electric contact for a short time by illumination of a photoconductive medium with a short pulse. Fiber-based optical sampling  of optical signals (e.g. fast bit patterns in an optical fiber communications system) exploits the nonlinear interaction of some short sampling pulses with the probed waveform via fiber nonlinearities. A bandpass filter is used to isolate a nonlinear mixing product, which is subsequently detected with a photodetector. In some cases, different techniques are used at the same time. It is possible e.g. to generate a high-bandwidth microwave signal with a photoconductive switch and analyze its effects by electro-optic sampling. When data are recorded in the time domain for different delay times, the delay time is often varied with an optical delay line, realized e.g. with a corner cube prism on a motorized translation stage. This approach, however, called synchronous sampling, limits the speed with which a range of delays can be realized, and consequently the speed with which whole transmission spectra or the alike can be recorded. Much faster data acquisition is possible with asynchronous sampling, using two different mode-locked lasers with slightly different pulse repetition rates. 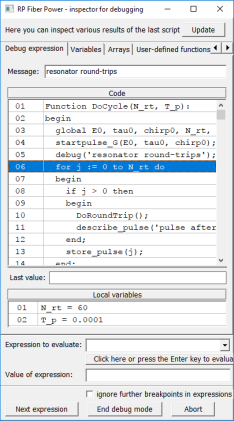 This automatically provides a temporally varying delay between the two pulses. The difference in pulse repetition rates determines how many times per second the measurement interval – given by the inverse average repetition rate – is scanned. This effective scan rate, however, must be low enough to allow for a sufficient temporal resolution, which is then limited by the detection bandwidth (not by the pulse duration). A high pulse repetition rate helps, provided that it is low enough to allow for a sufficiently large temporal range. As an example, asynchronous sampling with two 1-GHz mode-locked lasers is sufficient for recording terahertz transmission spectra with a 1-GHz frequency resolution, corresponding to a temporal range of 1 ns. A 10-kHz difference of repetition frequency means that 10 000 spectra per second can be recorded. This allows one either to record data for many samples per second (e.g. to obtain position-dependent transmission spectra or even two-dimensional transmission images), or to average many spectra of a single sample within a few seconds, lowering the detection noise to a very low level. Using fast detection electronics, it is possible to record thousands of transmission spectra, ranging from virtually zero to several terahertz, within 1 s.
The asynchronous sampling method can be applied in essentially the same way to other pump–probe measurements, e.g. to measure the recovery dynamics of semiconductor saturable absorber mirrors or similar structures. An additional advantage of asynchronous sampling is that mechanical noise of the delay time and position-dependent mode sizes are avoided. On the other hand, all the advantages obviously come at the cost of requiring two lasers instead of one.